Toss aside your library cards and grab your passports - we're leaving the sewers! I present a Turtles gem with worldly flair. 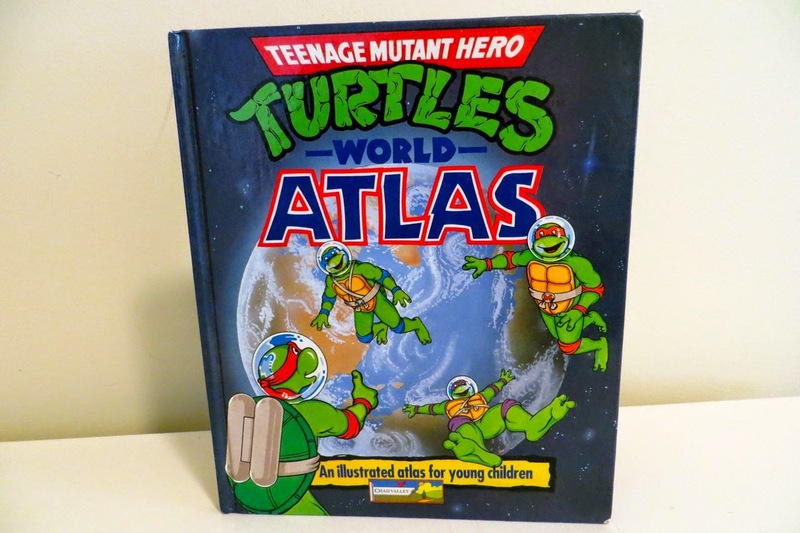 Our favorite mutants bounce around the globe with their own World Atlas. The cover was the only image available when I purchased the book. 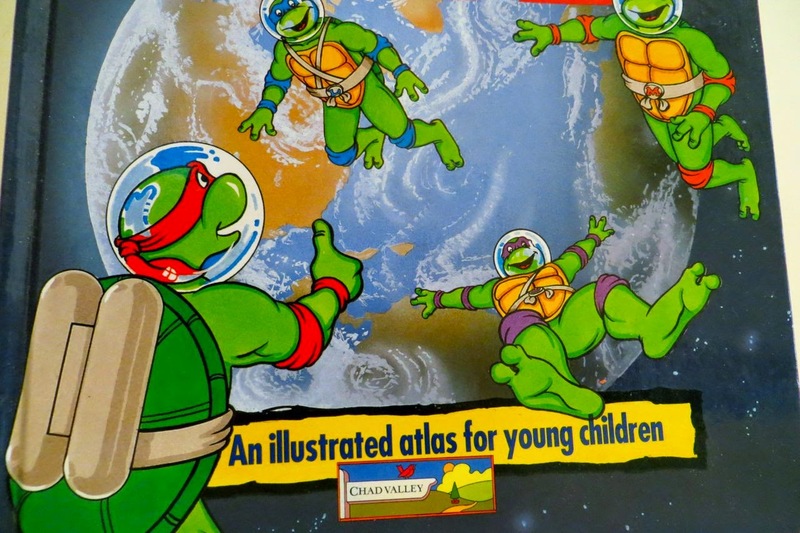 Would the 1991 publication be packed with global Turtle Power? Or would this book gather dust on the shelf? This is no dinky atlas. The hardcover edition measures 11" x 9" & contains 62 pages. 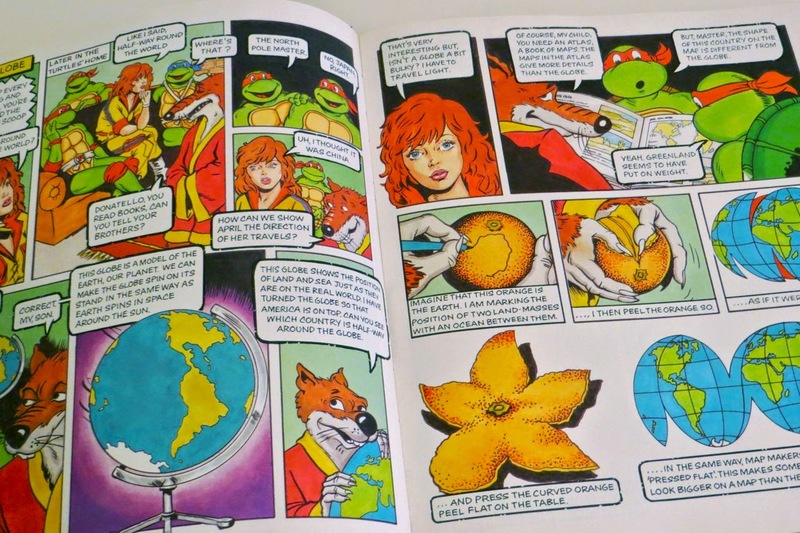 The title, Teenage Mutant Hero Turtles, indicates that this in an international publication (printed in Italy to be exact). Nope, the green machines weren't referred to as Ninjas in Europe. They were Heroes. Young children? Dudes in their 30s? What's the difference? Let's thumb through these pages. The inside & back covers both feature a standard map of the world. Don't fret. These are the only boring pages in this volume. Pair this first colored image inside the book with the cover and you might think this is a space atlas. Turtle Power orbits planet Earth - floating Turtle heads (along with Splinter & April) amongst deep blue, intergalactic hues. What sort of atlas is this?! The "Contents" page reveals a blueprint for the atlas. Hovering at the top of the page is a re-imagined Turtle Blimp. The iconic mode of transport has been fused with a map of the world. This page fired up my exceptions from a slow-boil to an inferno of excitement. Not only did this book seem educational, but it might provide a few laughs too. The atlas kicks off in comic book form. This came as a complete, but welcomed, surprise. 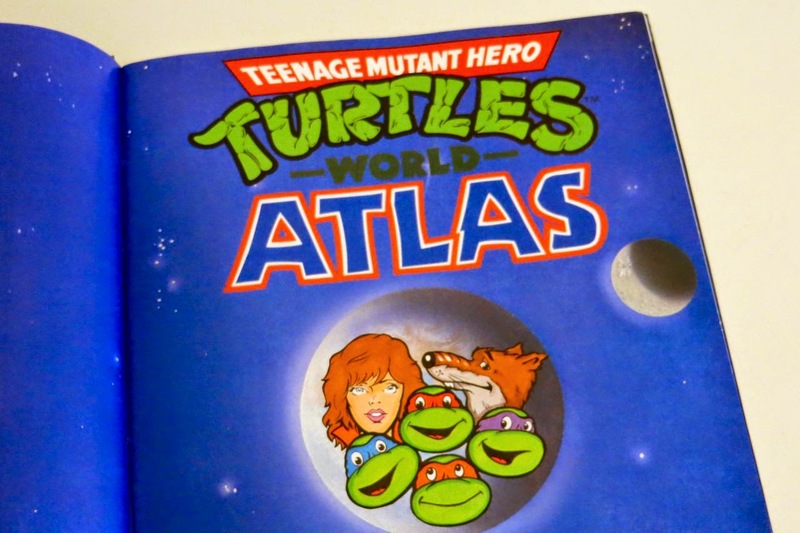 What a fitting intro for a TMNT (eh, TMHT) World Atlas! What other atlas opens with a narrative tale? Especially one in full color?! 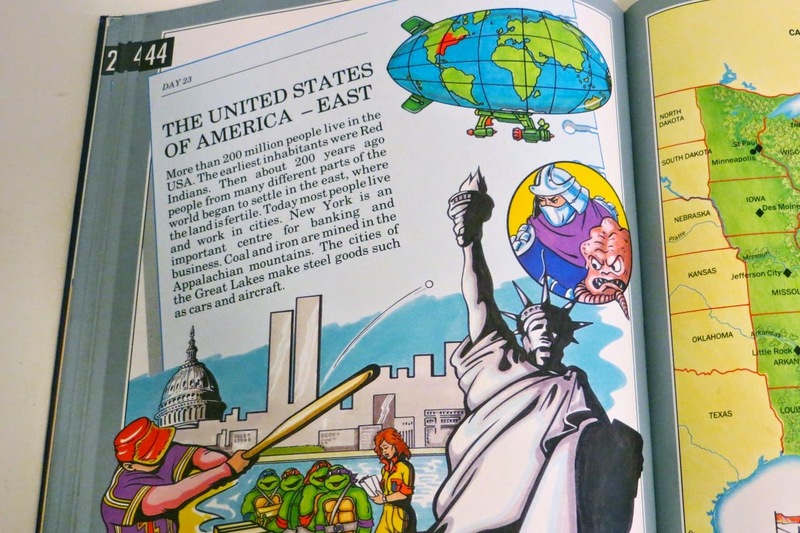 Flipping through the pages, the educational comic teaches the reader about the importance of maps, globes, and world navigation. For kids, it doesn't get much better than this. The information is presented in an amusing and entertaining manner. 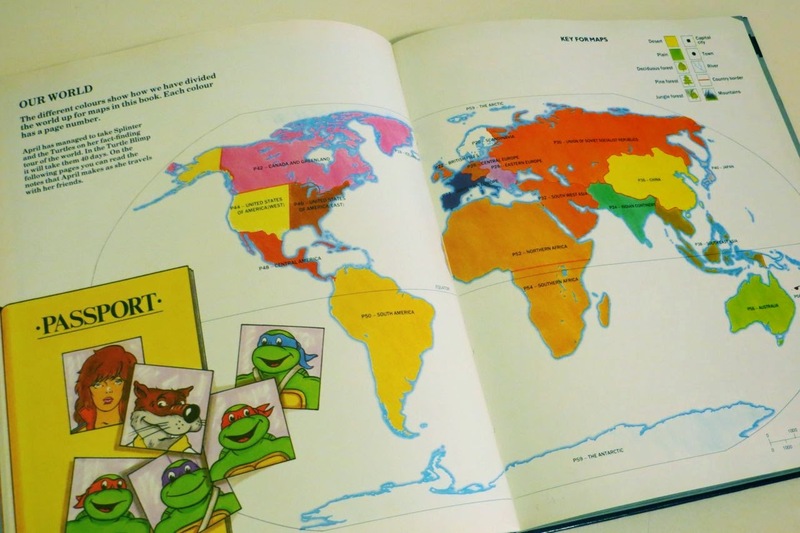 Too bad teachers didn't used the TMHT World Atlas in their classrooms. The story unravels, sending April around the world sniffing out a "global scoop." 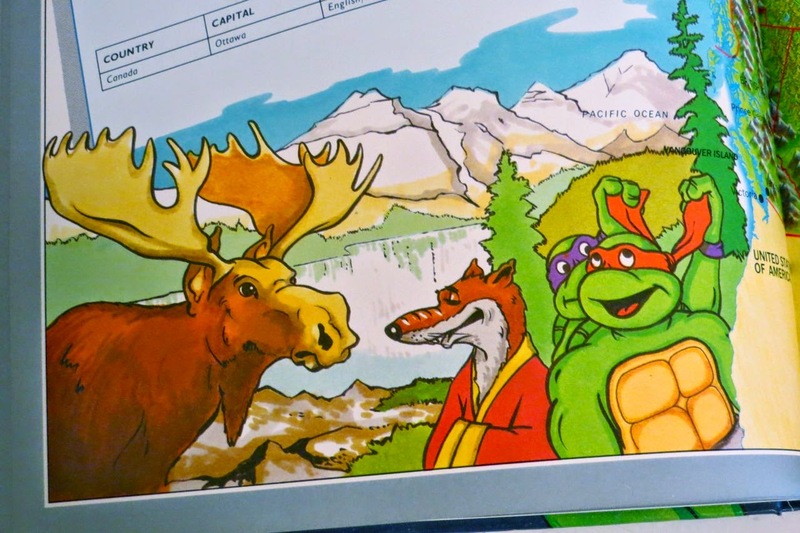 Splinter and the Turtles pack their bags and join as her travel companions. Forget Dimension X, our heroes have all of planet Earth to explore. This page gives us a synopsis of their upcoming journey. 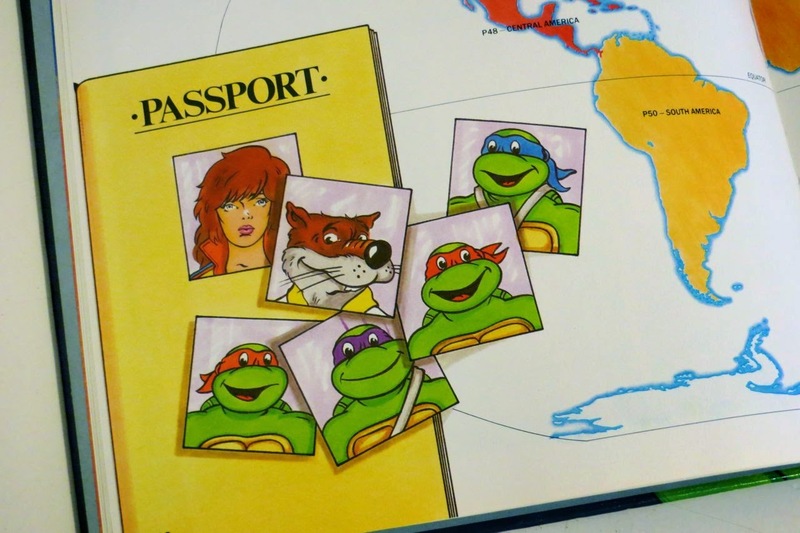 The gang grabs their passports as the international adventure is about to begin! Everyone seems happy about this, but April. The red-headed newscaster's passport photo looks like a mugshot. Maybe she isn't traveling for work, but actually fleeing the country. Jumping the pond, our first destination is Northern Europe. From here on out, every spread is similar - featuring 2 pages dedicated to a country or particular region. The left page tosses out key facts, such as history, national landmarks, exports, population stats, etc. The right page provides an illustrated map of the land and its surrounding areas. Most importantly, both pages contain our heroes in hilarious, cultural-specific situations. 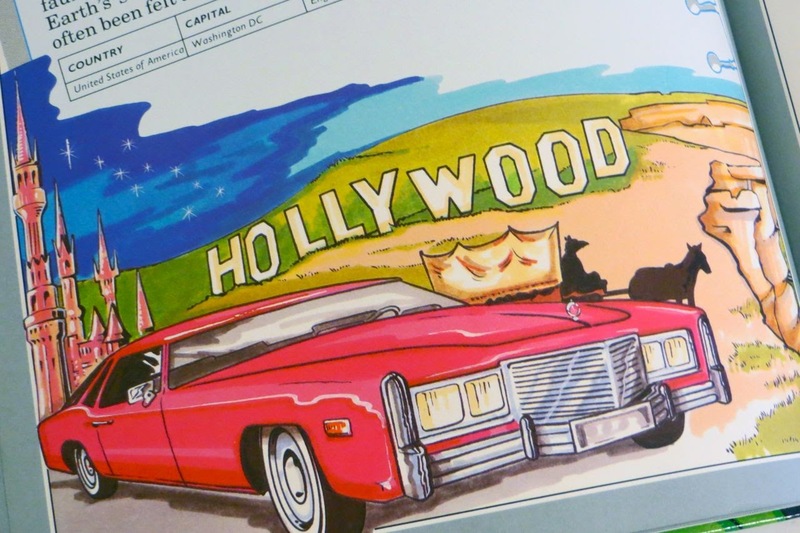 These illustrations are the highlight of the TMHT World Atlas. The book is literally packed with a world of amazing imagery, fun facts, and good-humored cartoons. It's overwhelming - in the most awesome way possible. But, there's just too much for me to include here. I've snapped a few photos of my favorites scenarios and quirky bits that caught my attention. You want educational? How about Raphael clinging onto a drum of oil with a frigid Leonardo shivering in the Arctic Ocean? Soak up the knowledge, kids. 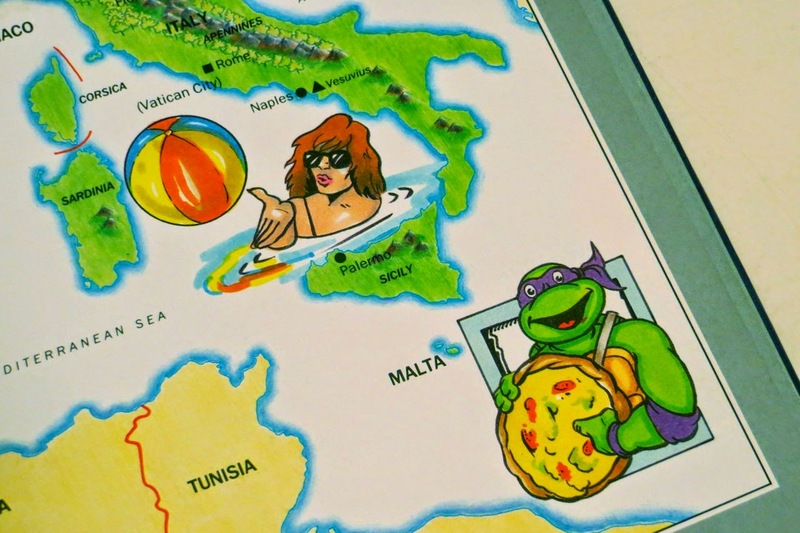 Home of all 4 Renaissance artists from whom the Turtles get their names, the Italy (Southern Europe) map provides plenty of goofy imagery. 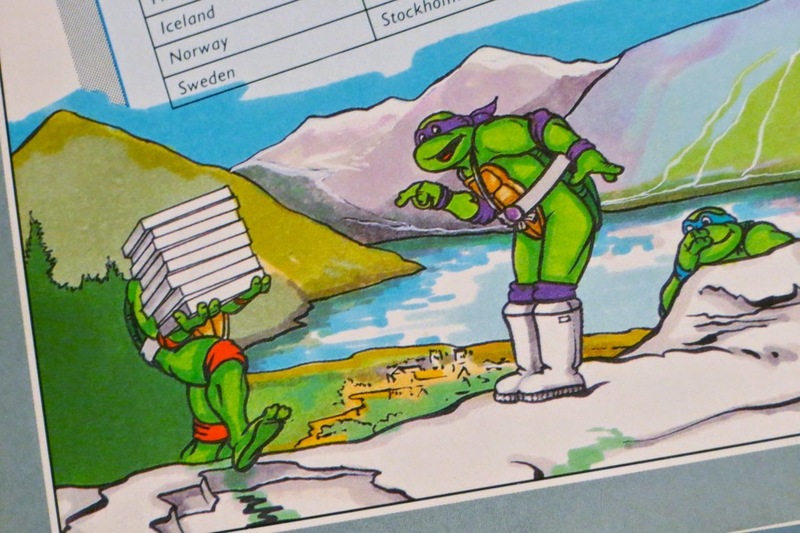 Donatello has never looked happier with this authentic Italian pizza. April stylishly swats a beach ball around the Mediterranean Sea. The two look like they're in paradise. Why would they ever go back to the sewers? I'm not one to ski. 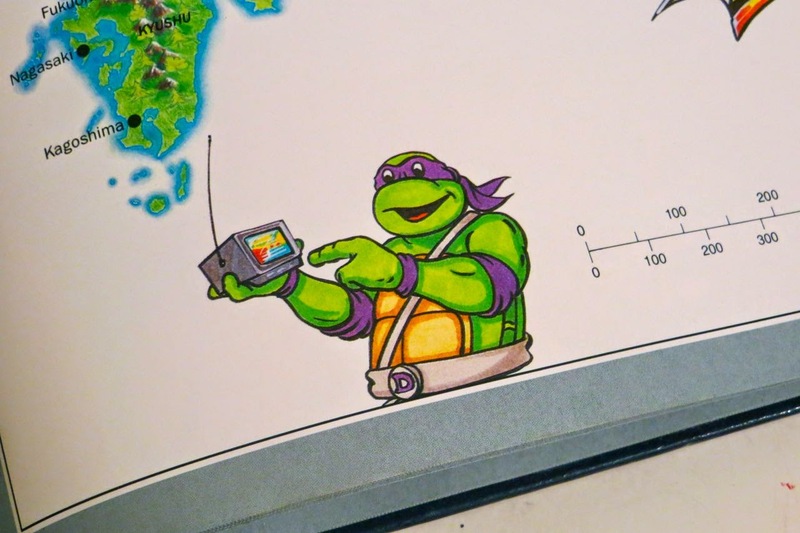 It appears Leonardo isn't either. If I ever venture to Western Europe, and get the chance to visit countries like Belgium, Switzerland, Austria, or Germany, you won't find me on a set of skis. 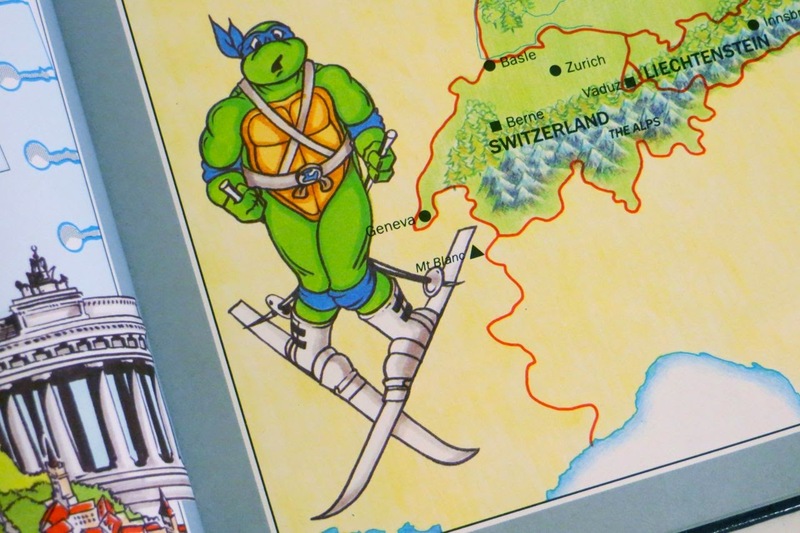 I'll be avoiding the Swiss Alps so I don't pull a Leonardo and look like this. When April O'Neil travels overseas, she's a force to be reckoned with. Just look at this speed demon - tearing down the road, stylishly covered with a classy scarf and chic sunglasses. And if you're a set out bagpipes, you better watch out. She'll gun you down. I don't think there's an image of Splinter where he looks more uncomfortable. Comb the internet, dig through your comics - you won't find one! Donatello no longer "does machines." He's made a career transition and now "does blue-collar labor." 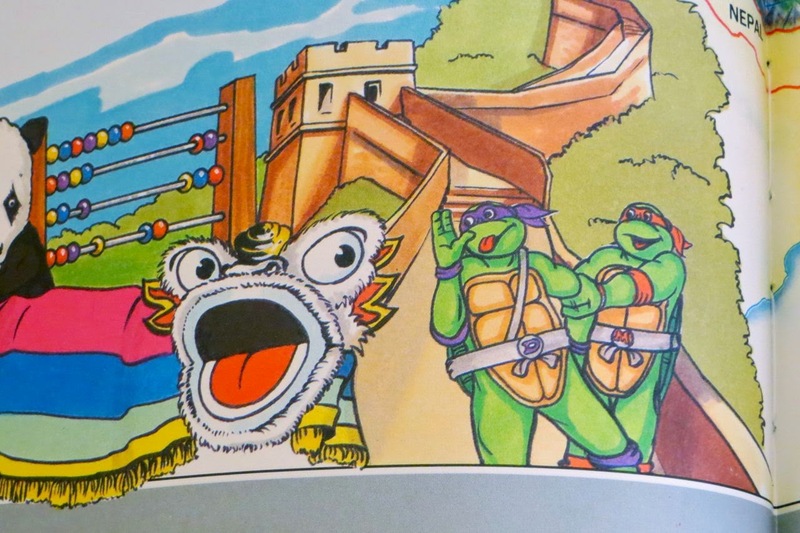 The Turtles' confusion here tickles me. 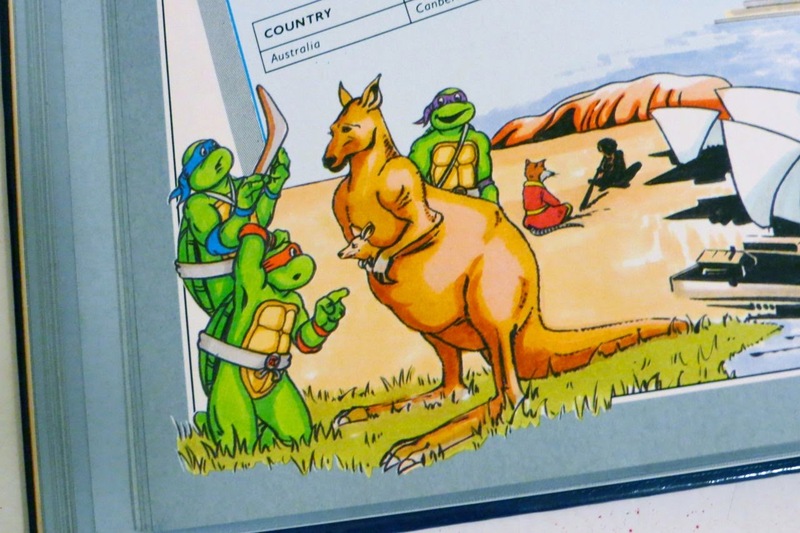 They take orders from a talking rat, have battled mutated creatures, and have traveled to other dimensions, yet they are so baffled by kangaroos and boomerangs? I also like the sensitivities of Australian history and culture presented here. Off in the distance, we can see Splinter chilling with an Aborigine learning the didgeridoo (wow, that was a fun sentence to write). It's a Turtle takeover on the world's highest mountain. 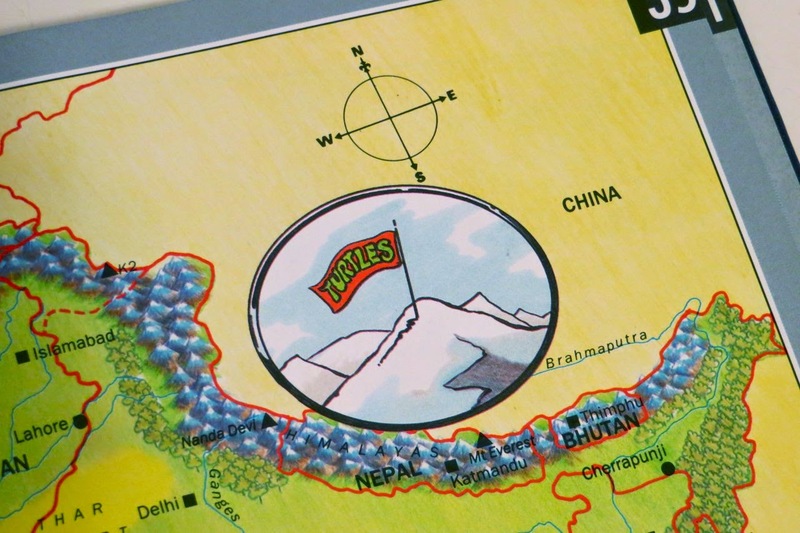 The green machines conquer Everest by planting a flag and letting it fly high. *Since the TMHT World Atlas was printed in Europe, neighbors is spelled neighbours. Finding these slight cultural spelling differences in this publication is like skimming through a "Where's Waldo?" book. This poor Chinese dragon. What did it do to deserve Donatello's ridicule? Can't it just climb the Great Wall & play with its abacus in peace? It's funny to see Michelangelo being the voice of reason here - pulling (a drunk?) Donny away from the mockery. The origin of ninjas deserves a proper place in the TMHT World Atlas. Splinter, back in his homeland, doesn't skip a beat. 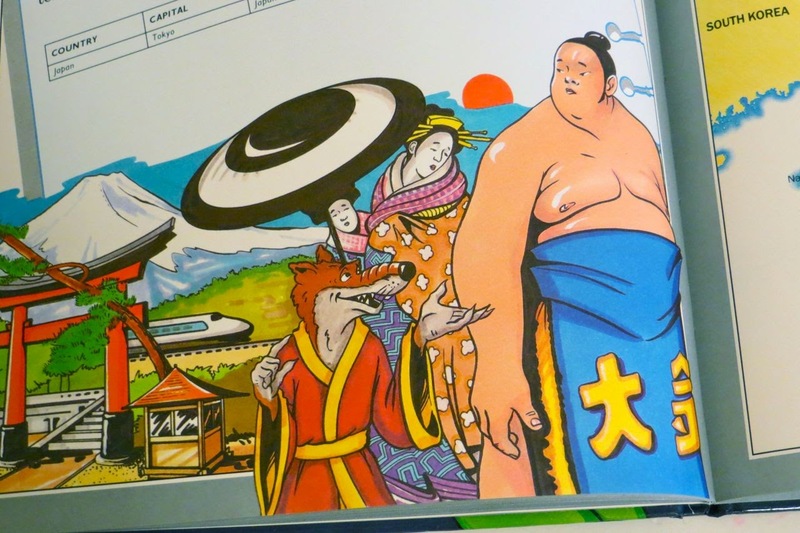 The rat drums up a nonchalant chat with this sumo wrestler and geisha pal. There are plenty of facts and history listed on the pages about South America, but it was this illustration that won my attention. 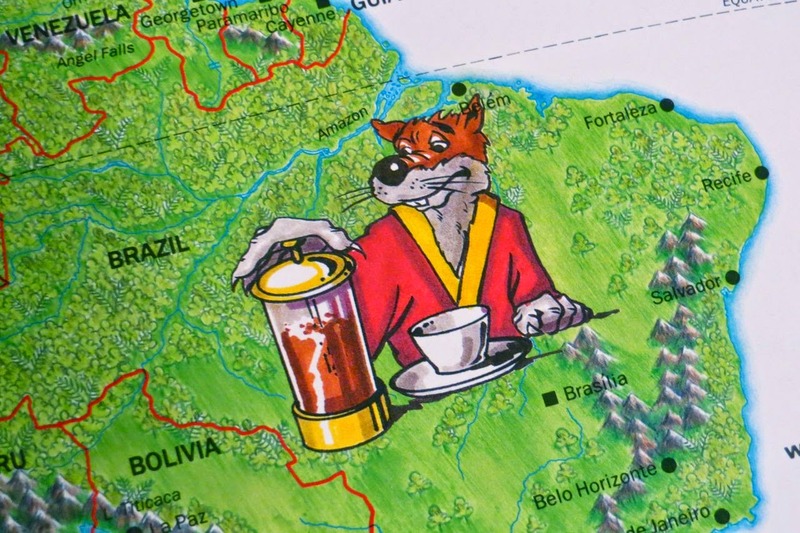 Splinter becomes a coffee connoisseur, using a French press to brew the ultimate, South American cup of Joe. I'd love to see this illustration in action figure form - "Coffee Snob Splinter" alongside "Barista Bebop!" Hey, my part of the globe! Buildings, baseball, the Statue of Liberty, and...Shredder and Krang? I've traveled this region thoroughly over the years and have never spotted the evil-doing duo. In 1991, the world was a less politically correct place. I'm not sure the words "Red Indians" would be printed in a modern atlas. Not cool, Turtles. America's glitz and glamour! I'm not exactly sure what that castle is in the background, but I'm guessing it's a unlicensed version of Disney Land. Between the East & West entries, the TMHT World Atlas makes the USA seem kind of lame. Am I being an oversensitive American? We have better things to offer than big cars and baseball. O Canada! You're so loosey-moosey. 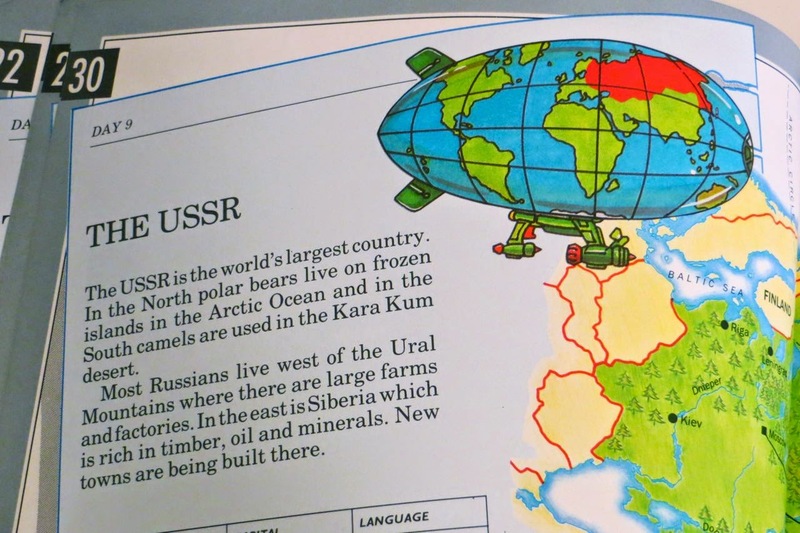 I love the pages about the USSR because most of the information is outdated and no longer accurate. The world is a different place these days, but that's what makes this entry so fun. When I purchased the TMHT World Atlas, I had no idea the imagery would be this good. 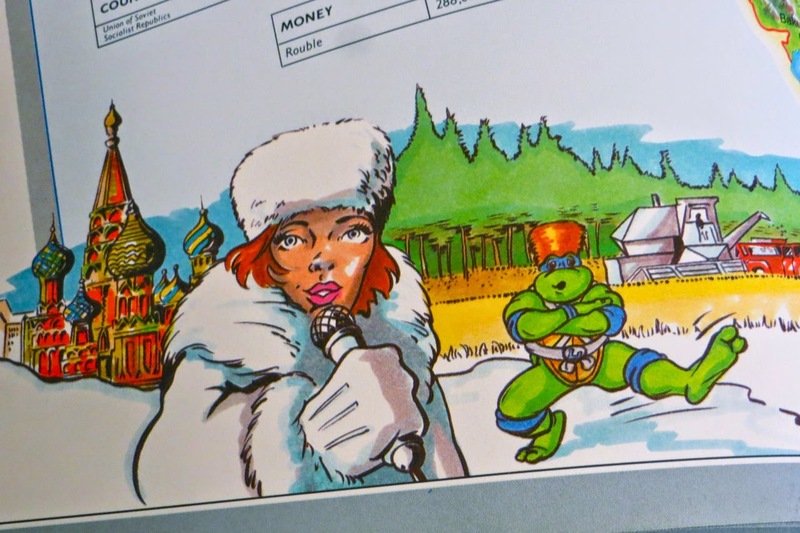 Reporting breaking news from the Kremlin is Mother Russia April - The Siberian Newscaster! At her side, we've got Leonardo breaking out his best Russian folk dancing skills. I don't even know what's happening here, but I love it. The journey around the globe ends at the Poles. 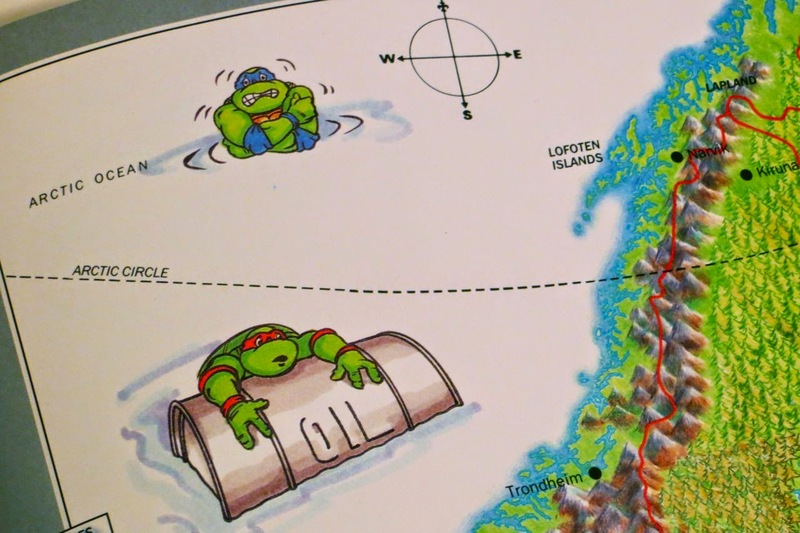 The last region highlighted in the book has Leonardo abandoning the sewers for life in an igloo. That barely seems like an upgrade. The final pages of the TMHT World Atlas are comprised of an index. After a multi-page, detailed story leading us into the book, I was surprised there wasn't an ending. Leonardo crawling out of an igloo makes for a disappointing conclusion. However, the world has changed since 1991. The USSR is a name of the past. The Turtles are massively popular once again. 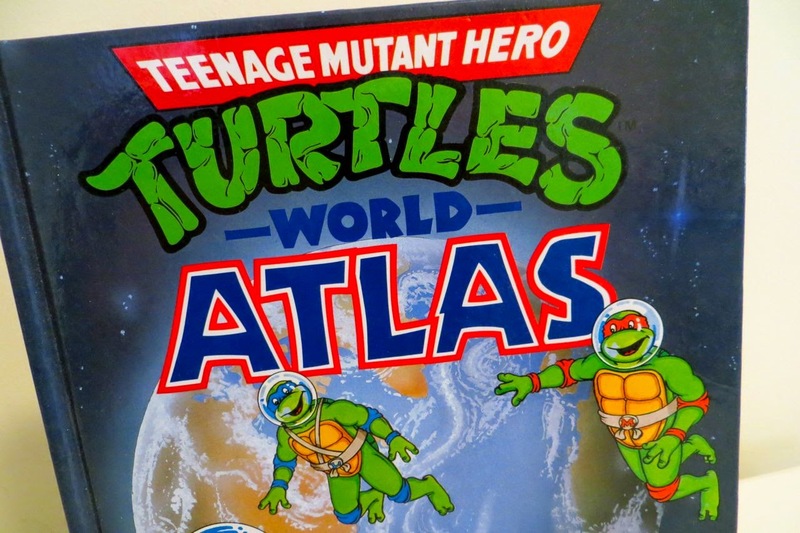 Maybe it's time for a TMHT World Atlas sequel. On with a proper ending brimming with action and adventure. TMHT World Atlas 2: Global Mutation. Who's in? Grab your passports. Wow, I haven't seen that for years, great throwback, reminds me of the old Peanuts collections of maps/countries/dinosaurs and such. It always killed me that they couldn't use the word "ninja" due to its violent connotations. I'm surprised they didn't edit their weapons so they looked like salami and breadsticks. It's funny how much the world has changed since this was printed. Some countries don't exist anymore, and there are countries that didn't exist then. Still, it was probably edutaining for any kid that was lucky enough to get it. Skiing in Belgium might prove difficult, for we don't have a lot of deep, solid snow. There is an activity called 'langlaufen', which is a German verb for cross-country skiing (or, as Wiktionary calls it, "A leisure activity using cross-country skis and ski poles for traversing natural terrain during winter."). And even that can only be done in the deep south of Belgium, the Ardennes in Wallonia. In Flanders (the northern part of Belgium), it's impossible to ski - there's just no snow! Luckily, you don't like to ski - so come on over. We Belgians welcome Turtles experts with open hearts, kindness and grace. Non-Turtles experts, too, for that matter. I'm packing my bags & grabbing my passport now. International Turtle Power!